Carrots can be stored for several months in the refrigerator or over winter in a moist, cool place. Twist off tops & refrigerate carrots in a plastic bag. For long term storage, unwashed carrots can be placed in a bucket between layers of sand, a 50/50 mix of sand and wood shavings, or in soil. A temperature range of 32 to 40 °F (0 to 5 °C) is best. This food is very low in Saturated Fat and Cholesterol. It is also a good source of Thiamin, Niacin, Vitamin B6, Folate and Manganese, and a very good source of Dietary Fiber, Vitamin A, Vitamin C, Vitamin K and Potassium. In season in the Rogue Valley from roughly July to November. When they were first cultivated, carrots were grown for their aromatic leaves and seeds rather than their roots. 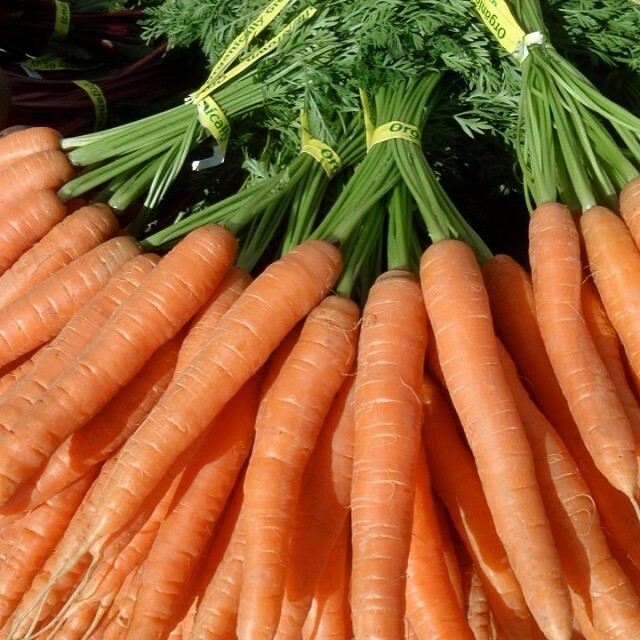 Carrot seeds have been found in Switzerland and Southern Germany dating to 2000–3000 BC.